Just a comment. I have no proof, only observations. I suspect that increased robbing behavior is directly related to the productivity of the nectar flow. This has always been been beekeeping common sense. Extracting after the flow was over always brought hoards of curious bees to the extracting area. But my comment is that robbing behavior in the bee yard (it appears) can be used as a barometer of the nectar flow. If weather temporarily stops the flow, I suspect that foragers will be attracted to the equipment that has their interest – even if the honey rewards are scant. I suspect if the flow starts up again, the robbing foragers will be gone. 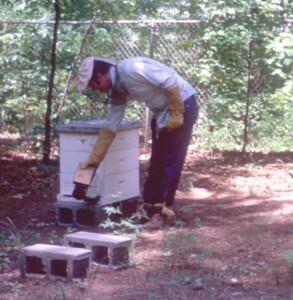 It is as though frames or combs still having small amounts of honey can give the beekeeper an idea of the condition of the flow that day in that yard. I’m only guessing. If I photograph, the pic only looks like robbing behavior. I had several large, late season swarms that are uncommon in Ohio. Two of the colonies did not successfully requeen. I am uncertain what this late season biology means for the bees and their colony survival. Any thoughts?